PLEASE SHARE this urban farming educational opportunity with everyone you know. Local farming education is where it’s at! And The Faith House (via the Sustainable Urban Agriculture Coalition of St. Petersburg) is a major contributor to this local effort! Learn to grow your own food or learn how to help others grow food. This is key to a local sustainable economy and a healthy food chain. WELCOME TO OUR NEWEST CUSTOMERS! Once you have submitted your order, if in doubt about what you owe, you can always confirm what you have been charged for by checking your account history and viewing your most current invoice. Instructions on how to do that are on our Q&A page under the question entitled Since you don’t provide an invoice with delivery, how do I know what I owe? . Also, since your vegetables are picked fresh within 24 hours of delivery, they should be lasting for WEEKS in your refrigerator. When you accept delivery, please take a few minutes to inspect your order to protect your vegetables from unnecessary spoilage. Lastly, it is imperative that you understand our policy on Unclaimed Orders found on our Q&A page. When you make a purchase you are agreeing to abide by this policy. 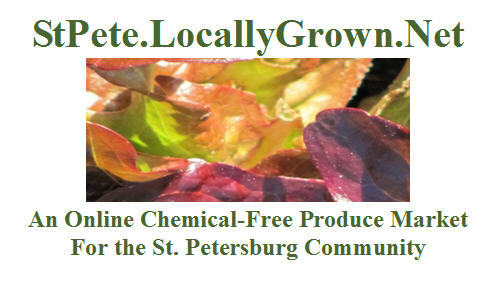 Check Out New Posts on our Market Community Blog on Google: stpetelocallygrownnet.blogspot.com ; Like to author on our blog? Send your request to tlevy@tampabay.rr.com. “Charlotte Smiled” Blog Post with review of our Market business model and exemplary products! “SUCCESSFUL URBAN FARMING IN ST. PETERSBURG” on March 9th, 1 PM Details are on Calendar of Events. This will be held every Second Saturday of the month and is open to the public. RSVPS are required and will help determine if the class will be held. Bring your friends and save $10 each on this valuable experience! You can now pre-purchase this workshop on our Market. This class makes a great gift for any occasion! RSVPs now being accepted. Sponsored by St. Pete Locally Grown, potluck socials are held on the 4th Saturday of each month. These events are held exclusively for actively participating Market customers, growers, and volunteers and are meant to create a social atmosphere in which to network, share resources and experiences. Wanted to let you know that there are some new items that just became available for order this week: kale, spinach, collard greens, and green onions. You can still place an order until Monday at midnight. If you have already placed an order for this week, you can place an additional order and it will be added to your first. Champaign, OH: Tell a friend, tell a neighbor! As I attended an inspirational event yesterday which discussed the increasing demands on the world’s food supply, I was reminded that we are on the right track with this whole local food discussion. The best option is to grow your own of course, which many of you do. Secondly, and this is the part where we come in, you can purchase your food locally from trusted growers. We strive and will continue to strive to assist you with both of these options. By hosting events like farm tours and other educational opportunities, we will help you to learn more about producing your own if interested and growing a stronger relationship with those that can provide items for you. Did you know that Champaign County used to grow almost everything: tomatoes, strawberries, blueberries…you name it! Harold Watters, a former local staffer with OSU Extension, said we would be amazed at how well many of those items did here. We know our soils will support these items but we have many other reasons they just aren’t grown here anymore. I would like to change this and encourage the growth again of these items. We’ll talk more about how I think we can learn to do this again later. To do this though, we need to continue to support both financially and emotionally the growers/producers that we do have who already stick their necks out year after year, through drought and hail, changing climates, increasing input expenses, and more. Supporting a farmer means money paid stays here at home in our local economy. It doesn’t get shipped overseas. It circulates here and allows them to reinvest in us: maybe expanding into another vegetable or fruit, buying newer equipment that improves efficiency of harvesting an item, or just allowing them to repair something that was broken. Every dollar counts. With each dollar you share with them, they are helping us. I know it was overused for many years but as a science geek myself, synergistic relationships benefit both parties. That is what I think of when thinking about the relationship between the farmer and the consumer. Both are better with the other around! So I’ll get off my soapbox and just ask you to share our website with a friend or neighbor. Tell someone why you feel supporting your local food system is important. Recommend a particular vendor and share your favorite items. As the bumper sticker says, “No Farms, No Food”. That is the truth. My guess is you ate something today, and I’ll bet you’ll do it tomorrow too, so please consider shopping local when at all possible. It matters. Countdown to Spring market has begun! All greens still available … Can get greens customized: all roots, all greens or combo greens with roots. All conveniently packaged ready to cook or freeze. Accepting new vendors…see Growers page. Keep it fresh, local and lively! Good chilly evening. The “in-between” markets online ordering is now open until late Wednesday. The spinach and salad mix are harvestable, if the weather is sunny enough to get the hoophouses well above freezing (it was great a couple days last week). I am hoping for Thursday harvest, but Monday looks good too. If you quickly order by mid-day Monday, I will harvest for you so you are sure to have fresh greens. Otherwise, I’ll wait for Thursday. New in the list is duck eggs! The ducks are responding to the longer days by laying eggs. They are wonderful with huge yolks. You may either pick up your order at Rehoboth Homestead Friday or Saturday, or I will deliver to your home or worksite on Friday. Please give delivery/pickup instructions in the comments box when you order. Madison GA: The market is open!!! See everyone Wed and we will have Lori’s world famous (well sort of) crab cakes! It’s spring cleaning time at Falling Sky Farm. We’re clearing falling limbs out of pasture edges, burning brush piles, cleaning up overgrown fencerows, putting in new fencing….in other words, frantically getting ready for the growing season….which may be upon us already. The grass is looking greener and thicker every week, the cows are mooing anxiously, longing for fresh greens after months of eating dry, dusty hay. Soon we’ll be fastening tarps back on to our fleet of chicken coops, preparing them for another 9 months of production after their lonely winter fallowing. Honestly I’m itching for springtime. I miss the colors – white and pink blossoms bathed in fresh green. I miss the smells – wet clover in the morning, honeysuckle on the breeze, even the pungent chicken poop. Most of all I miss working comfortably in a t-shirt and straw hat instead of coveralls and a wool cap. I guess I should keep in mind that one of these frosts will be the last one, and then it’s work work work sweat sweat sweat all the way to November. I got interested in farming because I wanted a slow, peaceful lifestyle. Ha! Real farmers spend most of their time trying to catch up. The market is now open. Go to conway.locallygrown.net/market to place your order. Click the checkout button once when you’re finished and you will receive a confirmation email when your order has been received. Thanks and have a wonderful week. GFM : Computer or human error? Not really sure if I messed up and didn’t get the list out for all our customers to see. So, just to be on the safe side, I’m sending the list out and leaving the market open until 5 pm tomorrow, Monday Feb 18. I do apologize for any inconvience or confusion this may cause. I promise, I WILL get the hang of this program yet! Citrus County Locally Grown: It's COLD out there! Good afternoon all on this fine, clear, BRISK day! We are experiencing what many of our growers hope is winter’s last Hoorah with freezing or near freezing temperatures last night, tonight, and possibly the next night as well. Tonight is supposed to be colder than last night so if you have plants out doors that are not cold hardy best to get them covered or moved inside ASAP! We’ll cross our fingers for everyone’s crops/plants. The market is open! Please be sure to check the many various category tabs to see what’s available this week as it does change week by week and you don’t want to miss what’s new this week! Blessings, Healthy Eating, and Happy Gardening you’all!